This post may contain affiliate links and I may receive small commissions for purchases made through them. Our move is complete, although our “settling in” is far from done. Turns out, 9 people have a lot of stuff. The only thing we haven’t unpacked: the books. We need to buy a bookcase first. My body is aching and exhausted (*except for one part) and for the last two days I’ve been having bizarre chest pains, probably a strained muscle somewhere in my back. Or front. During most of our move, the 2 year old was still recovering from the flu, meaning I was holding him in my arms or the Ergo all day long. But I’m not complaining! I love our new home, the yard, the neighborhood. Definitely an upgrade from our previous digs. This move has me once again thinking about the importance of the routines and habits in my life, and how they allow me to have maximum productivity with minimum wasted time and energy. Habits and routines sound boring and clinical, and some people eschew them. But the truth is, habits and routines let us do what we want to do in our lives instead of wasting time and energy doing what we don’t want to do. If that’s boring, I’m a card-carrying fangirl! See also the surprising power of rituals. Walking around the house, scratching my head, wondering where my keys or computer charger are (because there isn’t “a place” for them yet) is not a particularly exciting activity. I also take issue with the false dichotomy (usually uttered by “free spirit” types) that routines and habits are the realm of the uncreative. Utter hogwash and bunkus! All great artists I’ve read about had routines and habits that made their creative endeavors more prolific. I’ve also been thinking about how our immediate physical environment changes us. We’d like to think we control our environment, but our environment probably has more effect on US. The Power of Place: How our environment shapes our Thoughts, Emotions and Actions talks about this. I may pick it up and re-read it. Despite the chaos of moving, the laundry has all been done. Why? Because the washer and dryer are in the main level bathroom (and they’re both very new, high-end machines that are very quiet! ), making it easy to throw a load in. Last night I folded laundry while minding little kids in the tub. The streets around my home that lead to the main roads are hilly and winding (we’re at a higher elevation here, and are literally at the base of a small mountain), instead of the rather flat, more urban streets around our previous home. It gives me the same feeling I get when traveling in the mountains of North Georgia. Which is lovely. I feel like I’m on vacation, staying in a cabin. It’s fun. My picture is wonky, but not the rack. A level says so. 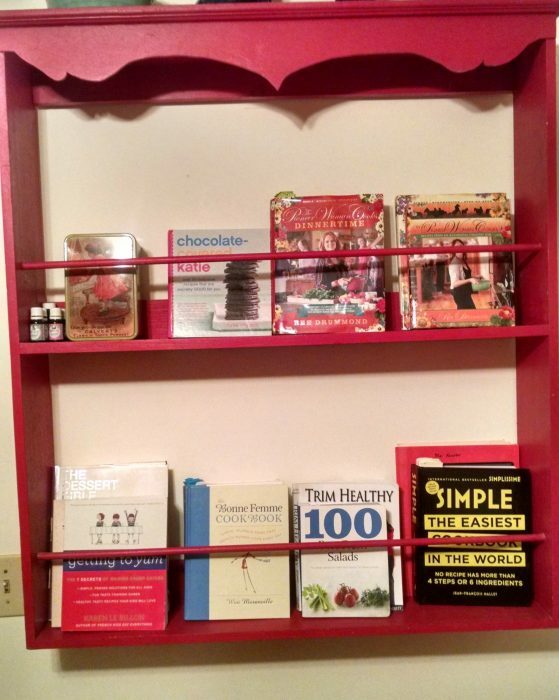 The cookbook rack my husband built. It didn’t work in our previous kitchen because there was literally no place to hang it, but it’s perfect in this kitchen! It’s been in his workshop for years, but now used for its intended purpose. 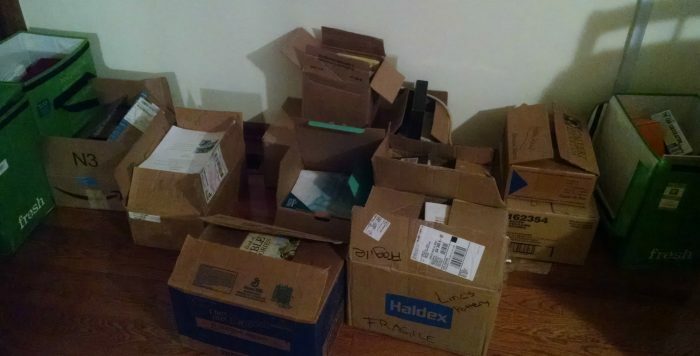 I have stuff ready for Craiglist and Goodwill because they just don’t work in this house, and another list of things I need to buy (bookcases!). And we gave away a ton of stuff last weekend before moving. My favorite grocery store is a couple of miles away, and there is a Starbucks right across the street and a children’s consignment shop a block away from both. Nice configuration! We’re also close to a wonderful park (the parks around our old place were skeevy), a botanical garden, several nice biking/walking/hiking trails, and a mountain. Hold the phone… I’ll actually have an OFFICE here. 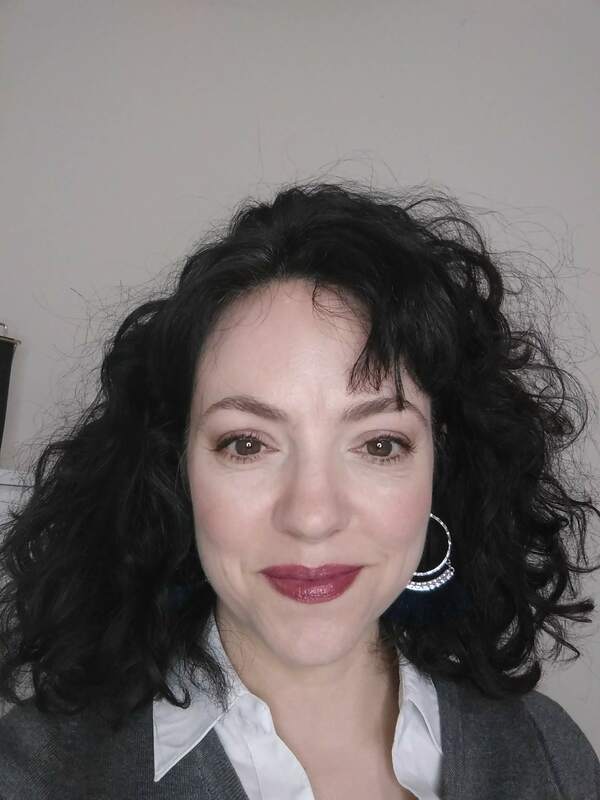 I didn’t think I was going to be able to manage a room of my own to write, and thought about converting a part of the master closet, or perhaps a corner of my bedroom. But neither of those is ideal. After all, woman must have money and a room of her own to write a blog. Especially if she wants to be able to stop going to Starbucks every morning and instead save or invest that money. My office is a large storage closet essentially, but we don’t need it for storage. I plan on building a standing desk in there. Joy! So that’s what I’ve been up to. I am eager to get back to my normal routine. I suppose the way to love routine is to have a life you love. To build a routine around the things that matter to you. I have. Which is why I’m eager to return to it. How do you feel about routines and habits? Are they boring or do they maximize potential? *p.s. The only part of my body that doesn’t hurt? My feet. I bought a pair of Unshoes minimal shoes and have been wearing them for about a week. I threw away several pairs of shoes yesterday. I’ve been living with chronic foot pain for many years, but when I wear Unshoes, my feet don’t hurt! 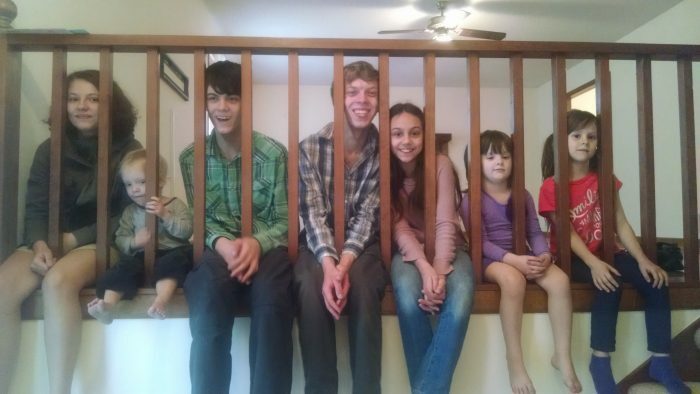 Carrie is a homeschooling mom of 7 and the author of this blog. More about her here. I LOVE routines and habits and feel like they cut down on a lot of wasted time. Girl, I feel your pain. lol We just moved between Thanksgiving and Christmas and oh. my. gosh. It’s a never-ending process isn’t it?! Moving STINKS. Good for you for having your own space though! That’s awesome! I think routines can put the “boring stuff” on autopilot, so you have more mental space to think about the fun stuff. I’m glad you all are settling in well! The move sounds awesome! It is great to have places around that are convenient, i bet the kiddos will have a great time this summer at the parks. I’m a little jealous you have an office, haha. I hope the little one feels better. You must have a split-foyer like us! The railing/stair setup looks familiar. Your new place sounds great with outdoor activities so close. Love your Unshoes! I had checked their website a while ago & at that time they only offered sandals. 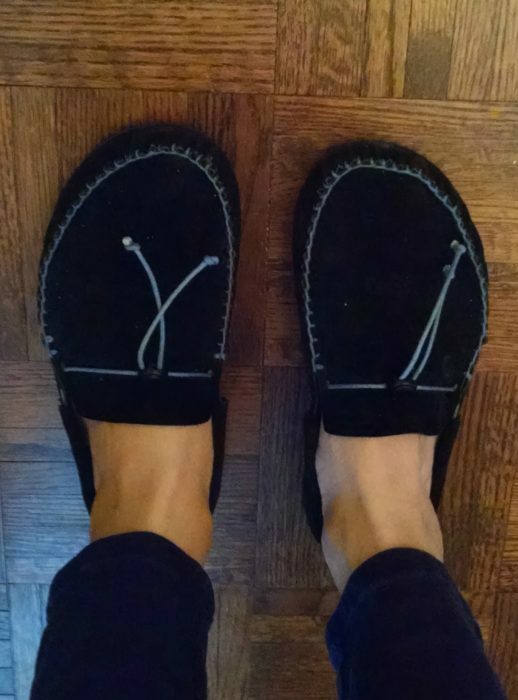 I normally wear soft star shoes (also minimal shoes), but I might have to try those mocs. I too had alot of foot pain, but with soft stars, no more pain. I might buy a pair of Soft Stars too! I want to slowly replace my shoe collection (already small) with minimal shoes. I love Soft Stars for my babies and didn’t know until recently that they had sizes for adults. It’s hard! But it was a definite good move for us, so here’s hoping we won’t have to move again for many years! Moving is hard (especially when you move onto a difficult road where you can’t park your moving van outside). If you think 9 people got lots of stuff – you should see what two people have got! Routines are so awesome that I get up at 4am every morning just to have a blogging routine. Not entirely the point of the post, but I am majorly crushing on your cookbook rack! Seriously about to force my dad to build me one asap! ITA with you about routines, that they provide us with more time to do the things we want. Habits and routines are for the SUCCESSFUL people. In fact, I love having a loose daily schedule. If I don’t have SOME kind of schedule, I get less done because I let myself get distracted. Bienvenue! My goal is to inspire and provide resources for moms to simplify their lives. With what aim? So they can find time and space for their own goals and passions during the busy mothering years. Simplifying the mundane to make room for the sublime. Let's put the "her" back in motherhood!